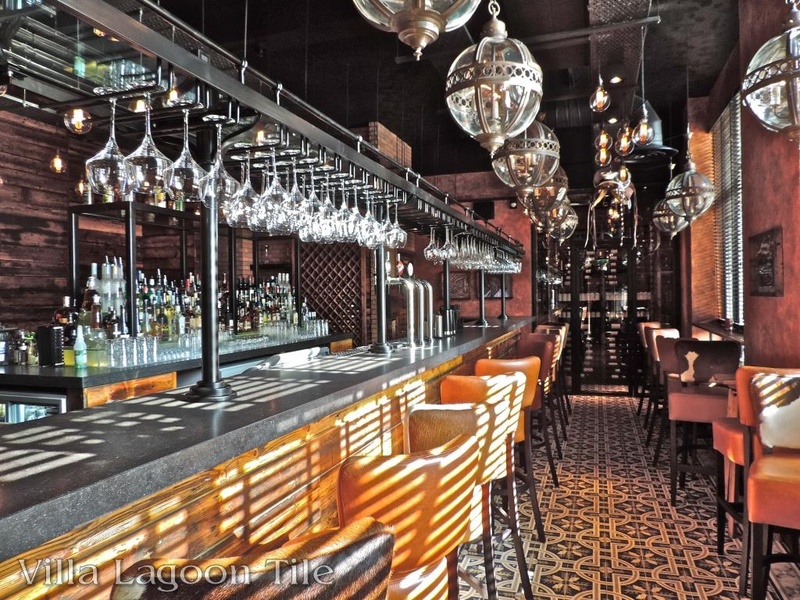 We’d like to introduce you the best new restaurant in Liverpool: Fadenza Rodizio Bar and Grill. 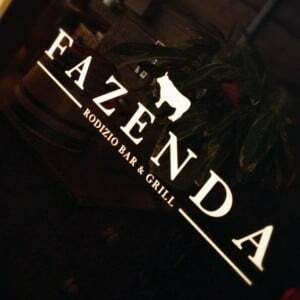 Portuguese for “farm”, Fadenza is a Brazilian Steakhouse featuring the famous churrasco (barbeque) of the Pampas region. The grasslands that stretch from Southern Brazil through Patagonia are well known for their cattle production and gaúchos (cowboys). 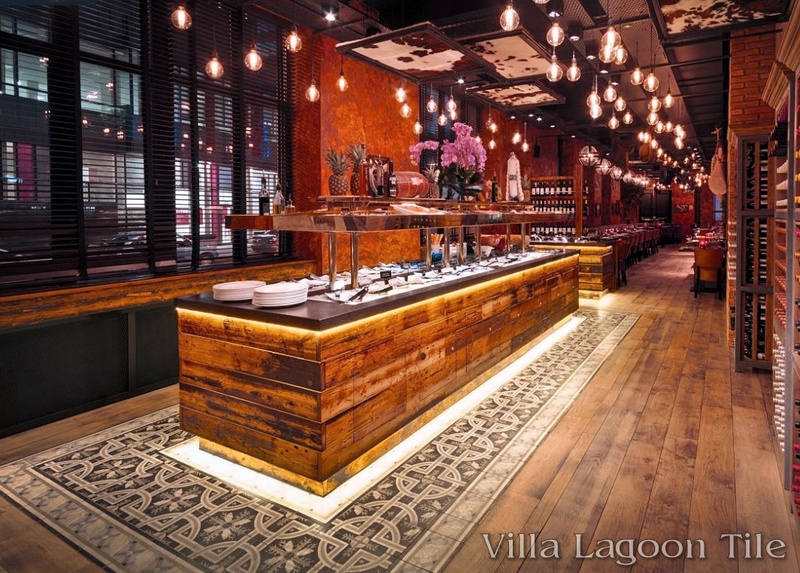 The gaúchos of the South American plains have developed a strong culture and cuisine, part of which includes rodizio dining. 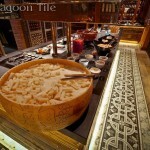 Rather than select your meal from the menu, you pay a flat rate for dinner. As the various meats come off the grill, they’re carried to the tables on a large skewer, where the servers slice cuts of beef, lamb, pork and other offerings through the meal. This phenomenon is sweeping the United States as well as Britain. 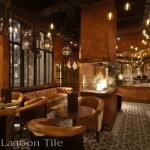 This is Fadenza’s second location, the first being in Leeds. 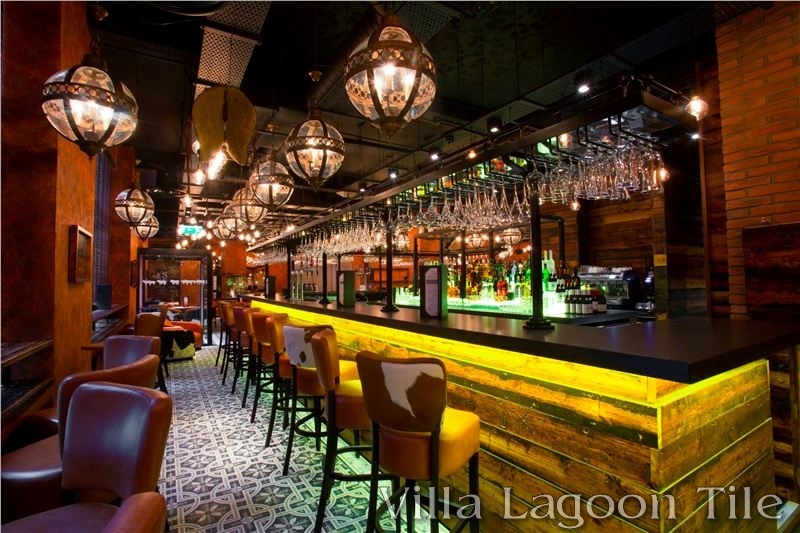 Though they’ve only been open a few months, they already rank on Trip Advisor as #3 of almost 1,000 restaurants listed in Liverpool, maintaining a 5/5 rating after over 130 reviews. 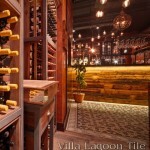 Numerous compliments were made about the warm and inviting decor that can perhaps be best described as “modern rustic”. 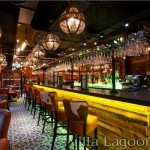 This masterpiece of hospitality design was created by Carroll Design, of Manchester, England. 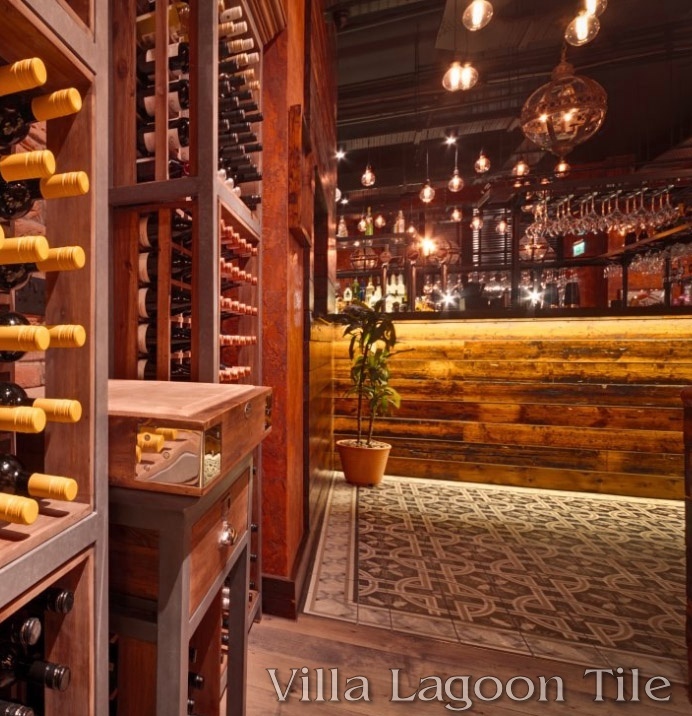 The decor features beautiful rough-cut timber on vertical surfaces such as bars and reception desks, with perfectly proportioned cement tile “rugs” separating spaces and highlighting important areas such as salad and side bars. Furnished with leather and cowhide, and decorated with saddles and other items from the tack room, any gaúcho would feel right at home. 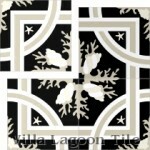 Used at Fadenza was “Trapani Midnight”, a Lundy P. Wilder original design, and Villa Lagoon Tile exclusive. To edge the walls and transition to hardwood flooring, the designer used another Wilder original, the “Shell Trellis” border and corners. 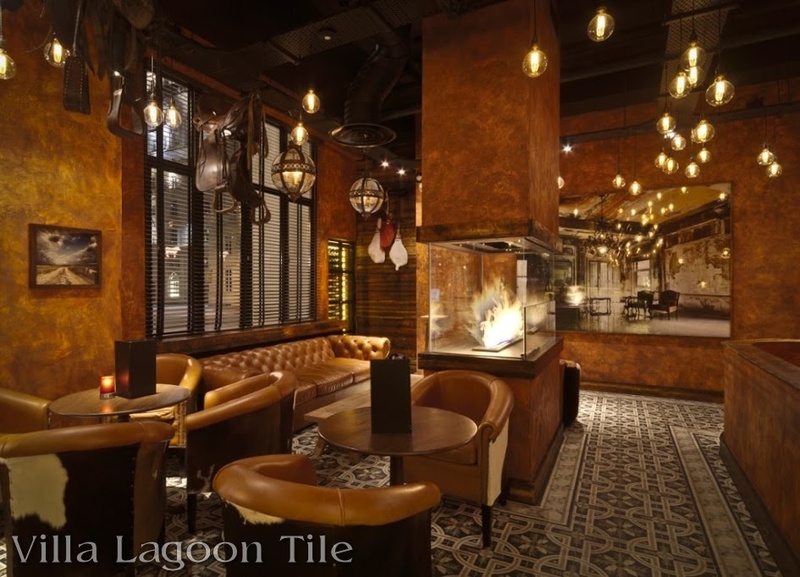 While their use had waned, most historic cement tile installations used borders, often using elaborate layers of several complimenting border patterns. 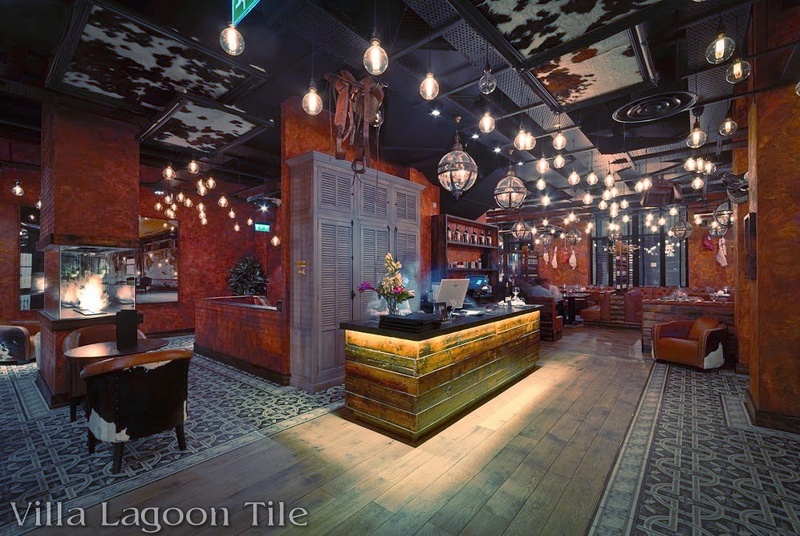 Many creative designers in the hospitality field have kept the tradition strong, using borders to separate various sections of different patterns or solid-color tiles. 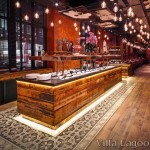 In this case the designer uses hardwood floors to direct traffic to beautiful effect. With the growth in popularity of open floor plans in the home, we may see a resurgence of this technique. Even though homeowners want to remove the walls, they still desire visual cues to separate and transition between eating, dining, and living spaces. 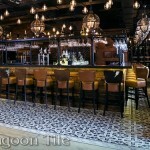 Flooring designs with cement tile borders such as used here provide the perfect solution. 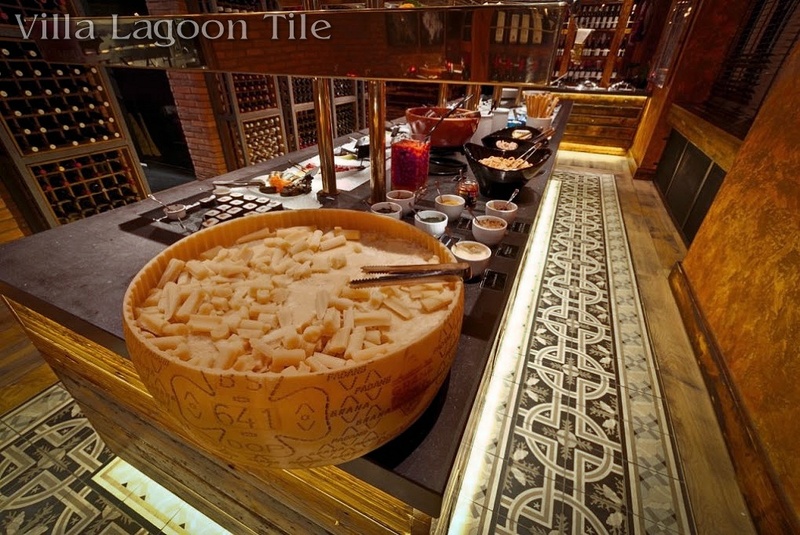 You may be asking as I did, “Isn’t Trapani an Italian-inspired design?” Yes, it is. In my research, I spotted that Rio Grande Du Sol, Brazil’s southern-most state is also Brazil’s “wine country”, and was the epicenter of a large wave of Italian immigration to Brazil in the late 19th and early 20th century. Poor Italians, primarily from the Veneto, Trentino, and Lombardia regions immigrated to southern Brazil where they could settle and establish their own farms. 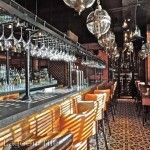 Also a good read is Fazenda’s blog. 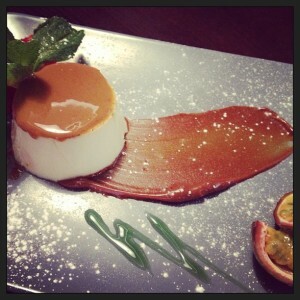 They share a number of recipes, including their recipe for Crème Caramel. 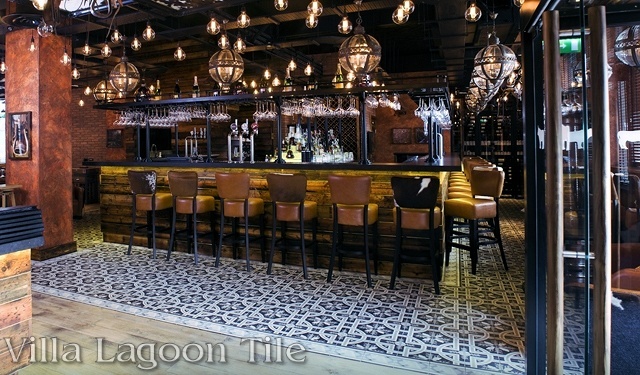 Previous Previous post: “Best of 2013” Design Award, a Cement Tile Win.